Widespread rashes that people may know are: hives, insect bites, and sunburn. If that is the problem, use that Care Guide. If not, use this Care Guide. Many causes of widespread rashes are not serious. Causes include allergic reactions and viruses, like the common cold. Adults with fevers and rashes should talk to their doctor right away. It could be a sign of a serious infection. Many causes of widespread rashes are not serious. Causes include viruses like a cold. Allergic reactions to a food, drug, plant, or insect bite can also cause rashes. You can treat most widespread rashes at home. No treatment is needed, except for heat rashes. A heat rash can be treated with a cool bath or shower. Wash the skin once with gentle, unscented soap to remove any irritants. Rinse the soap off. You may also take an oatmeal (Aveeno) bath to help with the itching. You can also take an antihistamine. Oatmeal Bath for Itching: Sprinkle contents of one Aveeno packet under warm running water. Bathe for 15 to 20 minutes. Do this 1 to 2 times a day. Pat dry with a towel. Try not to rub. Antihistamine Drugs for Itching: Take an antihistamine to help with the itching. Diphenhydramine (Benadryl) is a good choice. It is sold over-the-counter (OTC). The adult dose is 25-50 mg. You can take it up to 4 times a day. Do not take these drugs if you have an enlarged prostate. They may make you feel tired. Do not drink alcohol, drive, or use dangerous machinery while taking antihistamines. An OTC antihistamine that causes less sleepiness is loratadine (Alavert or Claritin). How It Is Spread: Avoid contact with pregnant women until you see a doctor. Most viral rashes can be spread. If you also have a fever, the rash is more likely to spread. 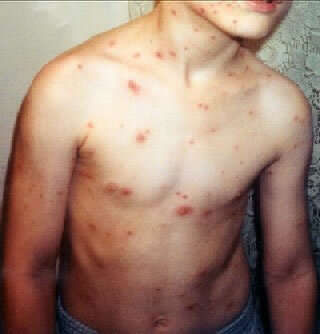 Return to school or work after the rash is gone or your doctor says that you can. What to Expect: Most viral rashes go away within 48 hours. 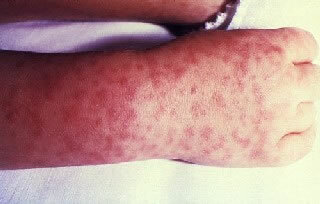 This photo shows the lower legs of a patient with the typical rash of Rocky Mountain Spotted Fever. 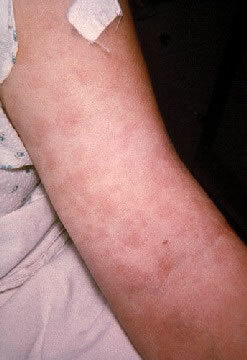 There is a wide spread red rash (red spots). There are also some petechiae (very small red-purple spots that don't blanch when you push on them).